Decay can frequently be found below the gum line. In order to gain access to the decay, it is necessary to reduce some of the bone surrounding the area of decay so the gum tissue can be positioned either higher up or lower down on the tooth making access to repair decay feasible. In other circumstances, the tooth may fracture below the gum line. Often the tooth requires a crown (cap) to cover over the fracture line. In order for the crown to fit over the fracture line, it is necessary to raise or lower the gum and reshape the bone accordingly so that the fracture line now becomes visible above the gum. The tooth is now ready for a crown (cap). When smiling, ideally there should be a display of upper teeth and a slight amount of gum displayed as well. In many circumstances there is an excessive amount of gum displayed (this is known as a gummy smile). In order to reduce the gum display so that there can be an ideal amount of tooth and gum showing, it is necessary to move both the gum and bone higher up on the teeth. The bone is gently sculpted to create room for the gum tissue to be ideally positioned. Hence the correct proportions of the teeth and gum are now visible. 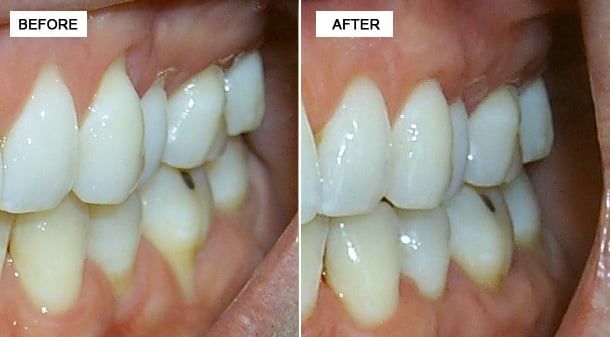 When deep pockets between teeth and gums (6 millimeters or deeper) are present, it is difficult for a dentist to thoroughly remove the plaque and tartar. Flap surgery is a procedure where the gum flap is lifted away from the tooth. Diseased tissue and sometimes bone is removed. The rough surfaces of the tooth are then smoothed by root planing. The area is medicated and the gum flap is replaced and sutured allowing the bone and gum tissue to heal. One of the goals of flap surgery is to reduce the depth of the periodontal pockets to make them easier to keep clean. The human skull has several cavities or air spaces called sinuses. When the sinus is enlarged and intrudes on areas where we want to place dental implants, bone or bone growth stimulation material is placed into the sinus. This procedure only affects the maxillary sinuses, which are located just over the molar teeth in the upper jaw. The side of the maxillary sinus is opened and the bottom is raised so it will fill in with bone. Several months later, dental implants can be placed in solid bone. An "Osteotome Lift" is a surgical procedure that raises the floor of the sinus directly over where the implant is placed. This can be done without actually opening the sinus.